James Heisig has argued for “desacralizing” translation, against “perfect translation” and for “thick translation”. 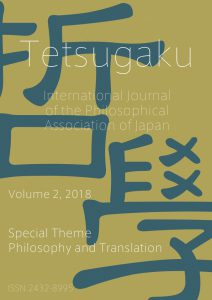 He advocates “a radical liberalization of the standards of philosophical translation” where translators of philosophical texts are “set free to err on the side of creativity and rhetorical elegance”. Heisig prioritizes broad appeal and readability over accuracy, bringing the translated philosopher into the reader’s space and facilitating an encounter on the latter’s terms by slaughtering “the sacred cow of fidelity to the original text”. In this presentation, I discuss Heisig’s programmatic statements on translation strategy in the context of the global dominance of English, declining language capabilities and unequal distribution of translation capabilities among Anglophone philosophers, the tendentially conservative and “domesticating” Anglospheric regime of translation, and the “foreignizing” alternatives found in Japanese translation history, in Schleiermacher, Nietzsche, Benjamin, and more recent translation theorists. I suggest that learning from professional practices in the translation industry could help translating philosophers strike a suitable balance between domestication and foreignization and that the latter is the ethically and intellectually sounder strategy. If some degree of butchery is inevitable, the question becomes one of how to serve the meat – as a thickly cut, well-done steak or as thinly sliced beef sashimi.